This is a new era for Whoop drones. 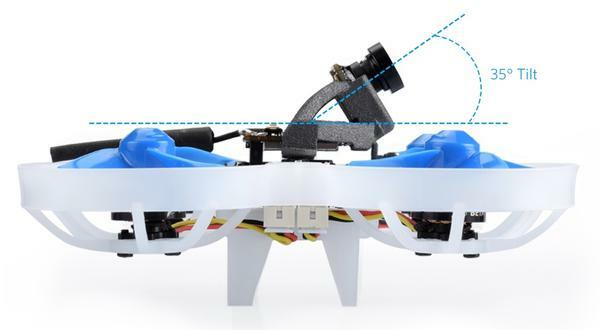 2S Whoop drones have the power to fly real acro like a larger quad but are still small enough, safe enough, and quiet enough to fly anywhere. Beta75X and Beta65X. X is for "eXtreme". There are 2 choices for the Beta75X battery. For the best performance, we recommend a 2S 350mAh battery with XT30 connector. If you already have many 1S whoop style batteries and want to use them on the Beta75X drone, then we also provide a PH 2.0 option for you. The two 300mAh Lipo HV 1S batteries can be inserted into the slot with the help of an adapter, as seen below. The AIO camera VTX on the Beta75X is a customized version of Z02. The VTX board and camera board are split and 35-degree camera mount for more fast flying. At the same time, it has all the other function of the Z02 camera, like output power switchable between 0mW, 25mW, and 200mW. Smart audio is available for VTX remote control in default. With the high-performance STM32F405 processor FC boards and tuned Betaflight Omnibus 3.5.0 firmware, everyone could fly the Beta75X drone like a racing professor. Durable and light enough frame is customed for the Beta75X. A total weight of 41g gives pilots a good balance of weight and nice punch on a 2S battery. 300mAh 2S high rate battery is recommended in default. 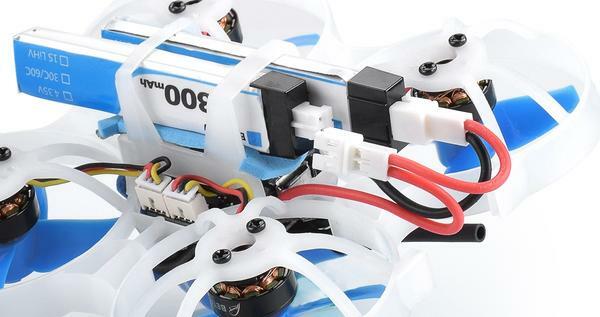 But pilot could also use their whoop batteries with a replaced power cable. Optional and affordable. For the moment, the FC board doesn't support programmable LED like WS2812 etc. The LED holder is designed on the frame nowadays. So we will update the FC board on the next version and release the suitable LED board. Note: there is NO rear LED holder for Beta65X in default. 2. I am interested in connecting an HD camera and DVR, but I don't want to overload the circuit of 5V. The 5V regulator on the FC board could handle 2A of load. So you could use it for HD camera or DVR board. More details, please check the FC board page. 3. Does this drone have a current sensor? 4. How to connect the receiver to the 2S brushless FC? Please don't forget to plug the battery when you try to connect the connector to the 2S brushless FC. Find out more details on our support page. 5. Cli Dump for different versions of the 2S Whoop is provided in our support page.